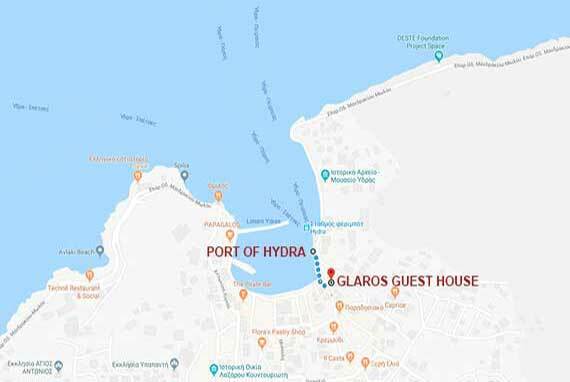 My wife and I stayed at the Glaros Guesthouse for five days during December, 2017 - January, 2018. What especially impressed us was the location. It was close to the boat harbor and to all shops and restaurants. Everything worked well at the Guesthouse: the television, heater, hot water, toilet, and internet. When we had a problem with a broken key in the room lock, the management responded at midnight on New Year's Eve and gave us keys to another room. Then they fixed the lock promptly the next morning and solved the problem. We will never forget their helpfulness in an emergency situation! Cozy comfortable and clean! Mr. Nikos a native from the island, very nice and friendly man. Also a perfect spot to get anywhere on the island, few meters, like 50-150 for shopping, cafes, restaurants, great views, and about 300 mts from the flying Dolphins, highly recommended for staying, and the pricing is on the best levels for the island! We have been there twice already. Perfect location a few steps from the ferry station. It was wonderful to be able to step out the door and explore Hydra. Several restaurants steps away. Beautiful terrace attached to the room. Friendly cats everywhere which is a definite plus for me! It was comfortable. The location in particular. Excellent location, 1 min from the marina bay. Very friendly personnel, clean room with a small but nicely arranged terrace, and an overall good vibe. Just the right accommodation for a short stay in Hydra with a partner or friend. So close to the harbour but surprisingly quiet. Basic but perfectly adequate room with great light and windows, small balcony. Loved it. It was perfect place for holiday on Hydra. Thank you. Great hotel, very central location, many restaurants very close by. Lovely view from our balcony. Staff were very nice and super helpful. Superb. The location and the set up with the rooms was just awesome. The look and feel was just perfect - quiet even we where so close to the harbor. Good place. Very good place close to the port. Rooms very clean. cheap basic but good. The location is very convenient one road above the port. Its a reallycheap basic place but good for a short stay on this beautiful unique island. Bathroom. a little small. Not a great view from our room. The comfortable beds, a/c, and quiet room made for a great rest. The location was only a few steps from the harbor and didn't require any climbing. The refrigerator allowed us to keep food for breakfast, which we enjoyed eating out on our balcony..
Clean, simple and great location. Awesome stay . Nice location very close to where the ferry drops you off, clean and spacious room, staff was helpful. Great for anyone with mobility issues, as it is very close to the port. It had everything you could need, small refrigerator, stovetop with pots and pans, dishes and silverware. Martina at the Glaros Guesthouse and her staff were very warm, welcoming and very helpful. It was a perfect place to stay for a family of four on a budget. Couldn't have asked for a better stay! Thank you Martina!! Charming room, very friendly and helpful staff/owner. Perfect location just steps from the ferry landing and the harbor. Very reasonable price.. It is perfectly situated close to everything. It was lovely to sit and catch your breath on the little verandah off our room.. Wasn't easy to find at first, but only because we went up the wrong road using google. Wish we could have spent more time there. Staff very happy to hold our luggage once we had checked out till when the ferry left. Shower curtain horrible but we found the showers awful in most of Greece. Got used to them.... You're on holiday! Lovely and relaxing. Good place in the middle though on the side. Nice and happy welcoming.